On this date in 1528, Anabaptist Ambrosius Spittelmayr was beheaded in Cadolzburg, Bavaria. Baptized by Hans Hut only the year before, Spittelmayr propounded his outlaw adult-baptism creed as a wandering preacher in Upper Austria and southern Germany before his arrest. The energetic Spittelmayr left his interrogators a 3,000-word confession of faith that has been of great value to scholars probing Hut’s own theology, which was deeply influential in southern Germany. Spittelmayr’s confession emphasizes a Godly life, including a version of primitive communism that called on the faithful to share their worldly effects — a prominent feature in much Anabaptist thought that helped certainly raised the hackles of those with property to protect. One of the recurring themes that these grim annals encounter is the Anabaptists; one might almost say that the movement’s birth pangs can be written in the blood of its martyrs. Despised in the 16th century of both Catholics and Lutherans, so-called “re-baptizers”* were hanged, burned, drowned, beheaded, and harried from pillar to post across Europe. 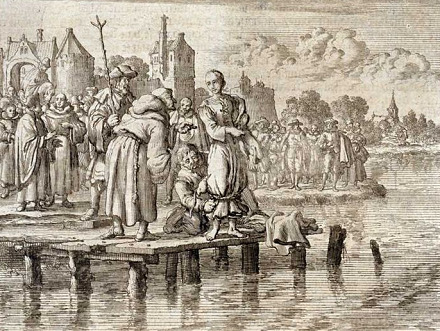 Anabaptists frequently suffered execution by drowning in Switzerland, Germany, and the Low Countries: an allusion in the execution spectacle to the disputed baptism rite. Pictured: Maria of Montjoie (Maria van Montjou), martyred on the German border in 1552. They’re forerunners of today’s Quakers, Mennonites, and Amish, among others; to find these amiable sects numbered among civilization’s existential threats over the disputed timing of a proper Christian ablution is to remember that the past is another country. Of course, there was more to it than that. To challenge infant baptism was to challenge the clergy’s power over the ceremony, and in turn to challenge the vertical hierarchy so essential to the period’s conception of the world. If the polemical Catholic charge against what we might anachronistically term “mainline Protestantism” was that the Reformation opened the road for disordering everything, Anabaptists looked like that very reductio ad absurdum made flesh. (Martin Luther was certainly keen to dissociate himself, as was John Calvin, who termed Anabaptists a “nefarious herd.”) Anabaptists took to primitive, fraternal Christianity — the kind thought to have existed among the immediate heirs of the Apostles before the Church became another word for the Man. They rejected as un-Scriptural the authority ordained ministers claimed as God’s interlocutors. Many Anabaptists also worryingly disdained private property. To a greater or lesser extent, these critiques (cousins of which had long drawn official persecution) contradicted the power of established Christian elites both secular and ecclesiastical. And though pacifism was a prominent part of Anabaptist thinking from the start, the movement’s idealism also fueled millenarian apostles bearing swords, and this too terrified Christendom. The 1524-1525 Peasants War (idealized by a later era’s Communists) was led by Thomas Müntzer, who was influenced by proto-Anabaptist preachers and who himself rejected infant baptism. A decade later, Anabaptists seized control of Münster and briefly turned that city into a polygamous theocracy. Surely Anabaptism, then being speedily reshaped by events, would connote a very different thing for us today absent the bloody defeats dealt to these revolutionaries — and absent the many executions that its persecuted adherents endured. We give this site over for the next several days to Anabaptist martyrs: not necessarily its most illustrious ones, but representatives of the many people stirred in those days to make a testament of faith on the scaffold. * “Re-baptizer” is the literal Greek root of the term Anabaptist. Affixed by their enemies, the word was long rejected by the Anabaptists themselves on the theological grounds that infant baptism was an empty ritual — and therefore adults weren’t being re-baptized at all, but simply baptized for the first time.